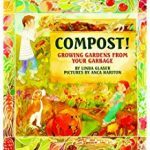 Linda Glazer’s book, Compost! Growing Gardens from Your Garbage, is a simple introduction to composting. In the words of a little girl, it tells the story of how a family builds a compost pile from the table and garden waste, maintains it, and then uses it to grow a new garden. The table waste includes scraps that every child can identify such as banana peels, bread crusts, carrots skins and apple cores plus lima beans that the little girl prefers to compost rather than eat . The moldy jack-o-lantern from Halloween, grass clippings, fallen leaves, and debris from the vegetable and flower gardens are included as are the droppings from the family’s pet rabbit, Lopsy. The little girl waters the pile with a hose, and Mom turns it over every few weeks, so that soon the children feel heat from the pile and later notice that the garbage no long smells or looks like garbage but looks like dark brown soil. The family plants vegetables and flowers with the compost and the cycle begins again. Two pages of questions and answers about composting provide adult readers with additional information including specific directions for a compost pile and instructions for an experiment creating a mini compost bin. Written for children ages 3-6, the book gets the general ideas of composting and recycling across in a warm folksy way. The text is enhanced by full page watercolor illustrations in soft earthy colors, each with a decorative border in complementary colors. The illustrations add another whole dimension to the book and could be used on their own to spur the imagination of young readers. An interesting note; the book was published in 1996 but is as relevant today as it was then. To buy Compost! 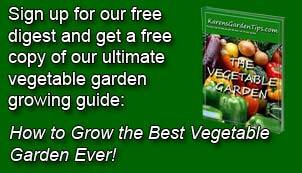 Growing Gardens from Your Garbage from Amazon.com Click Here.